The Variable Temperature Insert (or VTI) is a useful tool for studying material samples in a magnetic field at varying temperatures. The basic VTI consists of a cylindrical tubular structure that is inserted into the bore of a superconducting magnet. A sample is mounted onto a removable rod placed inside the VTI. The cylindrical structure separates the sample from the surrounding liquid helium environment. The temperature of the sample can be varied by flowing cold helium liquid or vapor through a throttle valve or by direct heating from an integrated heater. A cryogenic temperature controller can be supplied with the VTI. The VTI can be separate from the magnet for installation in a bottom-loading dewar or the magnet can be mounted onto the VTI. 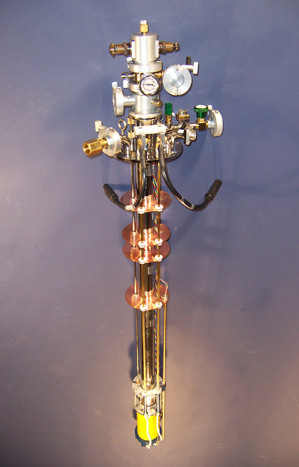 In this configuration, the VTI structure acts as an integrated support stand incorporating the magnet mount, current leads, liquid level instrumentation, fill and vent ports, and pressure relief valves. 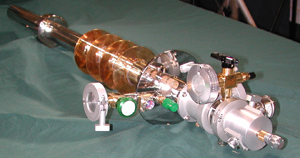 The Exchange-Gas VTI represents the simplest design and uses a single-walled tube in direct contact with the liquid helium. This tube can be evacuated or backfilled with helium gas. The sample is mounted on a removable rod within this tube and is cooled by thermal conduction between the backfilled gas and the cold tube wall. The sample can be heated by evacuating the sample tube and operating the sample mount integral heater. The exchange-gas style VTI provides responsive thermal control with reasonable temperature stability at a low cost. The Dynamic VTI provides improved thermal control by separating the sample from the liquid bath through a double-walled, vacuum insulated sample tube. The sample temperature is cooled by a flow of helium liquid or gas controlled via a throttle valve and is heated by integral heaters. The dynamic VTI provides excellent thermal response with greater sample thermal stability. The Integrated Dynamic and Exchange-Gas VTI combines the dynamic and exchange-gas VTI designs into a single unit. The cold flow from the dynamic portion cools the exchange-gas tube which, in turn, cools the sample through gas conduction. Integral heaters in both portions provide excellent heating control. The integrated dynamic and exchange-gas VTI design allows for the best sample thermal stability. VTIs can also be provided for critical current density or Jc testing. This VTI design integrates current leads into the sample space.